HNY Mark and Miro and all fans of this site! The 1N5711 don't look like clippers, am I mistaken? Yes they are clippers in a asymmetrical arrangement with two 1N4148. I bought some a couple of years ago from here and haven't used them for anything yet, so it was a bit of good luck for me. They are schottky's though, so if you want to try something similar then you could try BAT41, BAT43, BAT45, BAT46, BAT85, IN60 (schottky not germanium version), or even the 1N5817 which we often used in out layouts for polarity protection. Or if you're not so bothered just try normal silicon diodes, or LEDs and experiment. Thanks Mark.....yep, that's a Zen, alrighty. 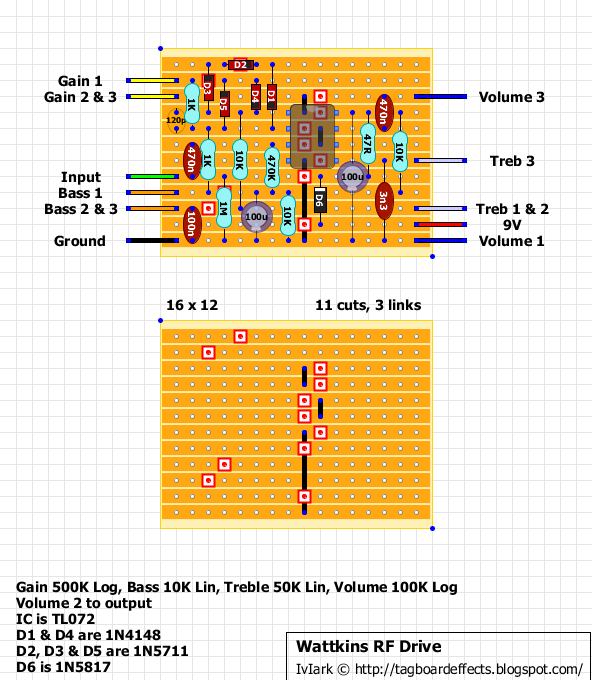 I just built a variation called the KOi Drive (KO amps) with a few different values. Very nice tone, indeed. Oh heck. I don't think I can get myself motivated to build another ZD type drive. sound compared to the original? No offense |V|ark, thanks for the great layout, and all your efforts. However, I don't have the 50K pot for the Treble control in hand. Can it be replaced by 100K or 20K ? How will the replacement affect the tone? Geezer, thank you very much for your quick reply :) I will try both of your suggestions. 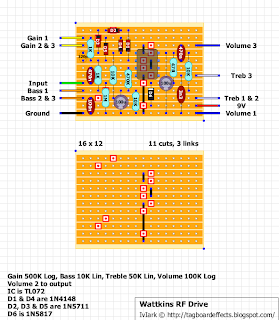 Mark, I have built this and it can be verified if the Bass connections are changed to Bass 1 and Bass 2 + 3 rather than as shown because at the moment the bass reduces when the pot is turned clock-wise. I used BAT85 instead of IN5711 because thats what I had (!) and I used a 4580DD rather than a TL072 because I preferred the sound. can anyone post a few pictures of their build (insides)? novice builder here and want to make sure I'm on the right track. Funnily enough, a friend of mine did the original PDF file linked in this thread.